Thanks to my friend Scott for sending me this: "Fifty years ago this week, the Beatles hit the road --- as the opening act for 16-year-old Helen Shapiro. This clip is from British TV, later that year. Ringo said that her dressing room was nicer than theirs, and that they had to ask to watch her personal TV set. Unlucky she was after that -- her record label, Columbia, rejected the chance to have her record the Beatles' "Misery", then after that, Lesley Gore's "it's my party". Obscurity, meet Helen." Here's a video of me running Vinemont Falls on East Fork of Flint Creek. Vinemont Falls on East Fork of Flint Creek, Alabama from Dangerjudy on Vimeo. Saving Shepherd Bend from Southern Environmental Law Cntr. on Vimeo. 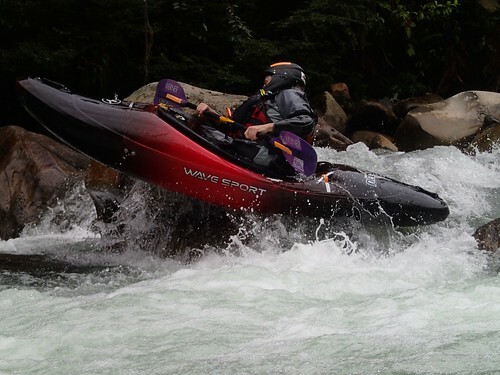 I was on an Endless River Adventures trip to Ecuador last week and thanks to ERA I was able to demo the new Wave Sport Recon 83 for five days. My stats are 5'6", 32 inseam, 160 lbs. Creek boat from 2007-now is a Riot Magnum 72. Other boats recently demoed- new Mamba 8.1, Mamba 7.6, Remix 69 (which I bought for river running). The Recon would presumably be a replacement for my Magnum. My purpose for a creek boat is to run easy class III - IV creeks in the SE. I didn't change the outfitting or seat position. The seat was in the middle, whereas normally I put the seat all the way forward in all of my boats. The seat front/leg lifter was ratched up and I never adjusted it. The thigh braces were further back than I usually set them. This setup was comfortable once I got used to the thigh braces being further back. The backband was pretty loose and I never ratched it tight. 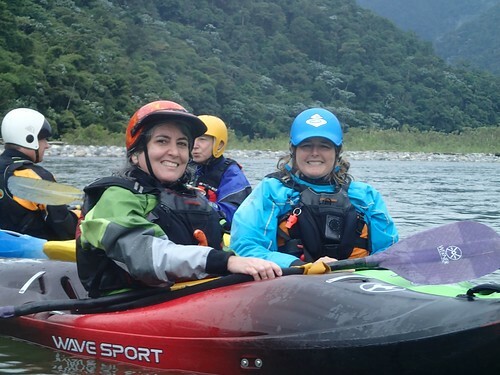 The Wave Sport outfitting is really nice; I never felt the need to crank down the backband or jam the bulkhead up closer, so I was comfortable while still having plenty of control and flexibility. Just from my experiences with the old Whiteout outfitting in my ProjectX I can say this new version of the Whiteout outfitting looks to be a lot better made and much more durable, though I wish it came in grey or black. 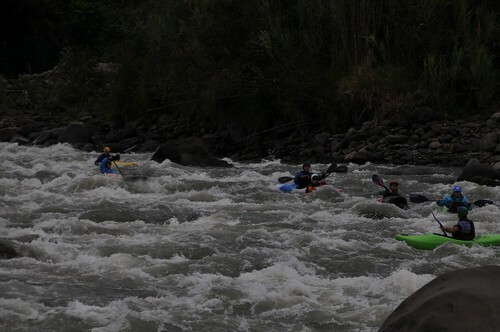 The first two days were on the big water of the Quijos river. The Recon 83 was surprisingly good in big water. 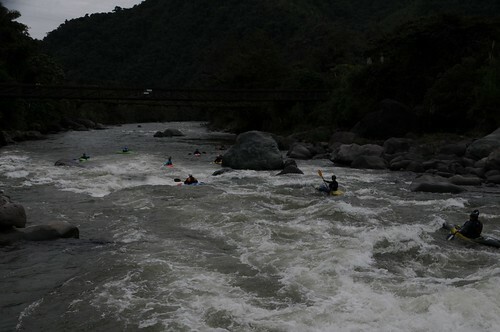 The two Quijos sections we did consisted of big class III wavetrains with long pools between rapids. The Recon held momentum through the wave trains without feeling squirrley. It stayed on the surface and went through holes on the surface rather than diving deep and squirting out like the Magnum. I never tested the secondary stability very much because the boat had so much primary stability. It tracked very well and I had issues turning the boat; I attribute some of this to unfamiliarity with the boat and not having the seat as forward as I am accustomed to. Occasionally I would get spun backwards trying to turn and once this resulted in me getting surfed for awhile in a hole, but with the extra gallons the Recon 83 was quick to move to the top of the foampile, making it easy for me to pull over the foampile and out. With more volume in the stern than my Magnum, the Recon never felt grabby in the stern nor did I even get close to being backendered. 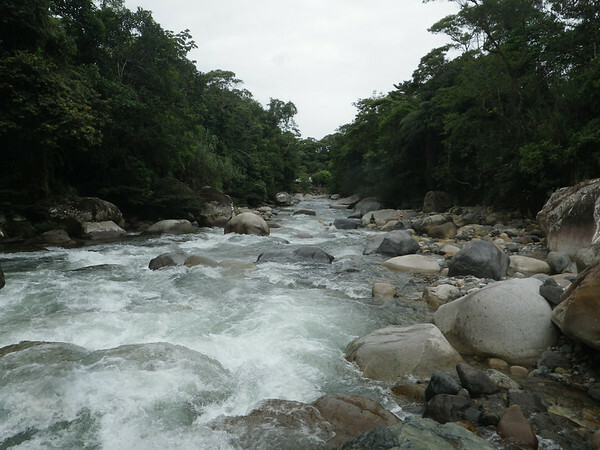 The third and fifth day we did the Upper Misahualli, a nice class III+/IV boulder garden creek that I wish could be transported close to home. The Recon 83 really showed its strengths here on the creek. Unlike my Magnum, which likes to be driven, I found that I could relax and let the Recon absorb the hits while I easily maintained momentum without having to drive hard. Catching eddies was effortless; there is a chine on the side of the boat that I've read was added for this. Someone who is more boat design savvy can explain how the chine was helping with carving. All I know is I never had to think about how I was getting into eddies, I was just zipping into them. Eddylines never felt squirrley, driving out of the eddies into ferries I blew some but that's one of the things I have to work on in any boat. The nose of the Recon is very rockered and it is the easiest boat to boof that I have ever paddled. The Upper Mis has a lot of fader boofs and it was easy to power off the boofs and switch edges to land flat and in control. I had my only two flips of the week on the Upper Mis, both from me coming through chutes without the correct angle, and I found the Recon very easy to roll as well. I notice I keep using the word 'easy' to describe creeking with the Recon and it's true. I also never felt like I was too small for the boat, even though it's 11 more gallons than my Magnum. 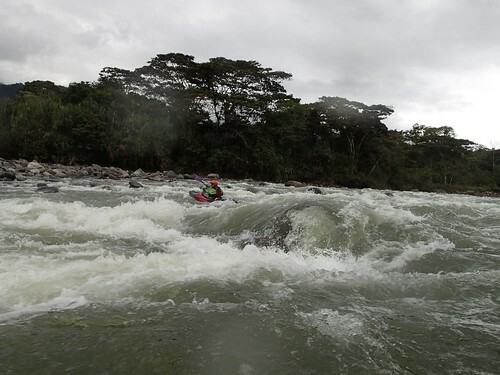 The fourth day, between our two Upper Mis creek run days, we did the Jactunyacu river which is another big water wave train run. Again, the Recon did fine on the big water and it was nice to be comfortable for what was an 18 mile paddle. So, what are the 'cons' I have for the Recon? It's heavy. There's a lot of extras in the outfitting, and some are probably superfluous. For instance, there is a rope holder above the bottle holder in front of the seat, consisting of a sheath with two fastex buckles and webbing. A couple of bungee cords might serve the same purpose and be much lighter. There are a lot of grab loops behind the seat, maybe more than I would ever use, and the grab loops are covered in clear plastic tubing which is nice but heavy. The boat looks and feels like it has a lot of plastic in its hull, especially in the bow, so it's like cruising a tank, which makes for feeling bombproof but of course is - heavy. I did carry it to a few put-ins and out of a few take-outs, and that (and a bum knee) inspired me to ask the guides for help carrying it for a few more. It specs out on Wavesport's site at 50 lbs and I want to weigh my Magnum and see how close its weight is to that spec. For most guys and many women this is not an important issue, but for a middle-aged woman like me, the weight of the boat is a consideration I must make. The only other con I can think of is my issues with turning the boat but again I think moving my seat forward more might solve that, or I could just adjust to the way it turns with the seat in the middle, because it tracked and paddled so well otherwise. Compared to the small and medium new Dagger Mamba design - the Recon felt like it was the 'right' size for me, whereas the small Mamba is too small, and the medium Mamba felt to me like a cork, while the Recon felt zippy. 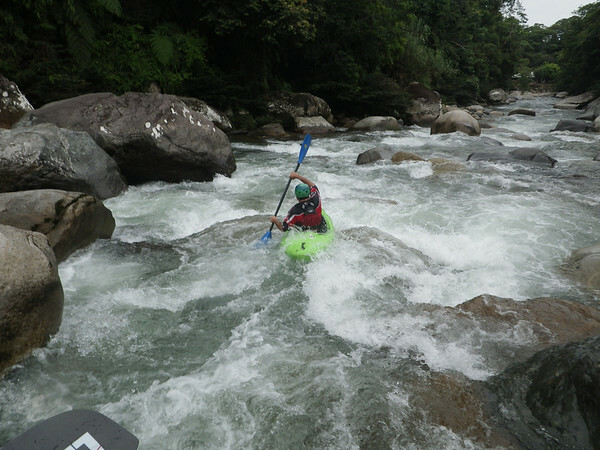 Compared to the Liquid Logic Remix 69, which I own as a river runner, the Recon felt more suited to tight turns and boofs on creeks, and the Recon 83 seems to have more primary stability for me. The Remix has crazy secondary stability, and paddles fast and elegant, but doesn't have the same bombproof feel while cruising that the Recon has. The Remix has a foam pillar and only two attachment points, in addition to the front and back grab loops, for z-drags. 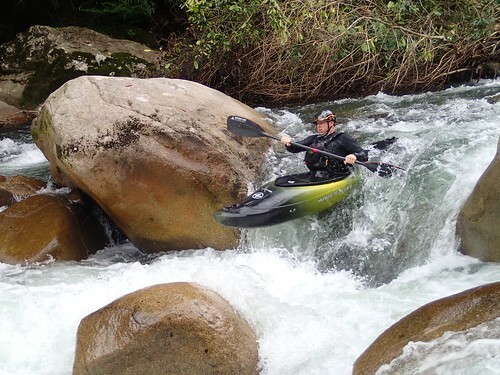 The Recon has a bomber plastic step pillar and five attachment points, in addition to the front and rear grab loops, nice safety features to have on a creek. (My old Magnum has only the 4 grab loops, not bars btw. The security bar on it fell off somewhere along our journeys together). If you're in the SE and want to demo the Recon, Endless River Adventures in the Nanty gorge has demos of the 83 and 93, and will have the 73 this spring.